The Mana series, known in Japan as Seiken Densetsu (聖剣伝説, lit. The Legend of the Sacred Sword), is a medieval-fantasy action role-playing game series created by Koichi Ishii, with development formerly from Square, and is currently owned by Square Enix. The series began as a handheld side story to Square's flagship franchise Final Fantasy, though the Final Fantasy elements were subsequently dropped starting with the second installment, Secret of Mana, in order to become its own series. It has grown to include games of various genres within the fictional world of Mana, with recurring stories involving a world tree, its associated holy sword, and the fight against forces that would steal their power. Several character designs, creatures, and musical themes reappear frequently. Four games were released in the series between 1991 and 1999: the original Seiken Densetsu (1991)—Final Fantasy Adventure in North America and Mystic Quest in Europe—for the Game Boy, Secret of Mana (1993) for the Super Nintendo Entertainment System, Seiken Densetsu 3 (1995) for the Super Famicom, and Legend of Mana for the PlayStation, though Seiken Densetsu 3 was not released outside Japan. A remake of the original game, Sword of Mana (2003), was published for the Game Boy Advance. All of the original games were action role-playing games, though they included a wide variety of gameplay mechanics, and the stories of the games were connected only thematically. In 2006 and 2007, four more games were released as part of the World of Mana subseries, an attempt by Square Enix to release games in a series over a variety of genres and consoles. These were Children of Mana (2006), an action-oriented dungeon crawler game for the Nintendo DS; Dawn of Mana (2006), a 3D action-adventure game for the PlayStation 2; Friends of Mana (2006), a Japan-only multiplayer role-playing game for mobile phones; and Heroes of Mana (2007), a real-time strategy game for the DS. Children was developed by Nex Entertainment and Heroes by Brownie Brown, founded by several developers of Legends, though Ishii oversaw development of all four games. Three more games have been released since the World of Mana subseries ended: Circle of Mana (2013), a Japan-only card battle game for the GREE mobile platform, Rise of Mana (2014), a Japan-only free-to-play action role-playing game for iOS, Android, and PlayStation Vita, and Adventures of Mana (2016), a 3D remake of Final Fantasy Adventure for the PlayStation Vita, iOS, and Android. In addition to the games, four manga series and one novelization have been released in the Mana franchise. The Mana series reception has been very uneven, with early games rated higher by critics than more recent titles. Secret of Mana have been regarded as one of the best 2D action role-playing games ever made, and their music has inspired several orchestral concerts, while the games from the World of Mana series have been rated considerably lower. As of March 2011, Mana series titles have sold over 6 million units. Square trademarked Seiken Densetsu in 1989, intending to use it for a game project subtitled The Emergence of Excalibur, and led by Kazuhiko Aoki for the Famicom Disk System. According to early advertisements, the game would consist of an unprecedented five floppy disks, making it one of the largest titles developed for the Famicom up until that point. Although Square solicited pre-orders for the game, Kaoru Moriyama, a former Square employee, affirms that management canceled the ambitious project before it advanced beyond the early planning stages. In October 1987, customers who had placed orders were sent a letter informing them of the cancellation and had their purchases refunded. The letter also suggested to consider placing an order on another upcoming Square role-playing game in a similar vein: Final Fantasy. In 1991, Square reused the Seiken Densetsu trademark for an unrelated Game Boy action role-playing game directed by Koichi Ishii. Originally developed under the title Gemma Knights, the game was renamed Seiken Densetsu: Final Fantasy Gaiden (published in North America as Final Fantasy Adventure and in Europe as Mystic Quest). Beginning with the sequel, Secret of Mana, Seiken Densetsu was subsequently "spun off" into its own series of action role-playing games distinct from Final Fantasy, named the Mana series outside Japan. Four titles in the series were released between 1993 and 2003. Secret of Mana was originally intended to be a launch title for the Super NES CD-ROM Adapter, but when the add-on was cancelled it was cut down into a standard Super NES cartridge, with many of the cut ideas appearing in other Square titles. It was followed in 1995 by the Japan-only Seiken Densetsu 3; the game was originally planned to be released in English as Secret of Mana 2, but technical issues and localization costs prohibited the release. The final new game in the series' initial run is the 1999 Legend of Mana, developed for the PlayStation. Legend is a 2D game like its predecessors, despite the PlayStation's 3D focus, because the console could not handle the full 3D world Ishii envisioned where one could interact with natural shaped objects. 2003 saw the release of Sword of Mana, a remake of the original Seiken Densetsu for the Game Boy Advance. The remake was outsourced to Brownie Brown, which was composed of many of the Square employees who had worked on Legend. In 2003, Square, now Square Enix, began a drive to begin developing "polymorphic content", a marketing and sales strategy to "[provide] well-known properties on several platforms, allowing exposure of the products to as wide an audience as possible". The first of these was the Compilation of Final Fantasy VII, and Square Enix intended to have campaigns for other series whereby multiple games in different genres would be developed simultaneously. Although no such project for the Mana series had been announced by this point, it was announced in late 2004 that an unnamed Mana game was in development for the upcoming Nintendo DS platform. In early 2005, Square Enix announced a "World of Mana" project, the application of this "polymorphic content" idea to the Mana franchise, which would include several games across different genres and platforms. These games, as with the rest of the series, would not be direct sequels or prequels to one another, even if appearing so at first glance, but would instead share thematic connections. The first release in this project and the sixth release in the Mana series was announced in September 2005 as Children of Mana for the DS. Four games were released in 2006 and 2007 in the World of Mana subseries: Children of Mana, Dawn of Mana, and Friends of Mana in 2006, and Heroes of Mana in 2007. Each game in the World of Mana series was different, both from each other and from the previous games in the series. Children is an action-oriented dungeon crawler game for the DS, developed by Nex Entertainment; Dawn is a 3D action-adventure game for the PlayStation 2; Friends is a Japan-only multiplayer role-playing game for mobile phones; and Heroes is a real-time strategy game for the DS, developed by Brownie Brown. While Ishii was the designer for all four games, he served as the director and producer for Dawn, which was considered the main game of the four and was released as Seiken Densetsu 4 in Japan. The theme of the subseries for Ishii, especially Dawn, was about exploring how to add "the feeling of touch" to a game. He had held off on designing new Mana games after Legend was unable to meet his desires, until he felt that technology had improved enough to let him create what he envisioned. A fifth game for the subseries was considered for the Wii in 2006, but did not enter development. In April 2007, a month after the release of the final game of the World of Mana, Ishii left Square Enix to lead his own development company, named Grezzo. No further games were made in the Mana series until 2013, when Square Enix released Circle of Mana, a Japan-only card battle game for the GREE mobile platform. It was followed in 2014 by Rise of Mana, a Japan-only free-to-play action role-playing game for iOS, Android, and PlayStation Vita, and in 2016 by Adventures of Mana, a 3D remake of Final Fantasy Adventure for the PlayStation Vita, iOS, and Android. In August 2017, a 3D remake of Secret of Mana was announced for PlayStation 4, PlayStation Vita, and Microsoft Windows, for release on February 15, 2018. The Mana series is the result of Koichi Ishii's desire to create a fictional world. In Ishii's opinion, Mana is not a series of video games, but rather a world which is illustrated by and can be explored through video games. When working on the series, Koichi Ishii draws inspiration from abstract images from his memories of childhood, as well as movies and fantasy books that captivated him as a child. Ishii takes care to avoid set conventions, and his influences are correspondingly very wide and non-specific. Nonetheless, among his literary influences, he acknowledges Tove Jansson's Moomin, Lewis Carroll's Alice's Adventures in Wonderland, and J. R. R. Tolkien's Lord of the Rings. While some titles of the World of Mana series do share direct connections with other installments, the games of the series have few concrete links. There is no overall explicit in-game chronological order. Further, according to Koichi Ishii in 2006 the games do not take place in exactly the same world, and characters or elements who appear in different titles are best considered alternate versions of each other. Instead, the connections between each title are more abstract than story-based, linked only on the karmic level. Contradicting this assertion, Ishii has also said in an interview that Children is set ten years after Dawn, while Heroes is set one generation prior to Seiken Densetsu 3. Game Boy The first game of the Mana series was marketed in Japan and the United States as a Final Fantasy game and drew many stylistic influences from the Final Fantasy series, but deviated in that it presented real-time, action-oriented battles comparable to The Legend of Zelda, rather than traditional turn-based battles. 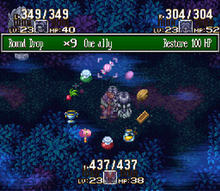 An enhanced port was released on mobile phones in Japan, which features an artistic style closer to the original game than that of Sword of Mana. In 2004, Square polled customers regarding interest in porting Final Fantasy Adventure and several other games to the Nintendo DS. Super NES Originally planned for the SNES CD-ROM add-on in development by Nintendo and Sony, the game ended up being altered to fit on a standard cartridge when the add-on project was dropped by Nintendo. The game introduced the Ring Command menu system, which enabled prompt access to features such as items or magic spells. In 2003, the game ranked 78th in IGN's yearly "Top 100 Game of All Time". Super Famicom Seiken Densetsu 3 introduced a degree of nonlinearity to the series, allowing players to choose at the beginning of the game a party of three members out of a total of six characters. Distinct encounters and endings can be seen depending on the characters selected. It was never released outside Japan due to technical bugs and the game being too large for Western cartridges, although an English language fan translation was released by Neill Corlett in 2000. PlayStation, PlayStation Portable, PlayStation 3, PlayStation Vita Legend of Mana features different gameplay from its predecessors. The locations of the game's world are represented on a map by artifacts placed by the player, with different artifact placements allowing him or her to obtain different items. The game features temporary sidekick characters that the player can recruit, breed or build, and a weapon and armor creation and tempering system. It also features a story with many diverging subplots. Critical reaction was mixed at the dramatic shift in gameplay and story structure from Secret of Mana. Game Boy Advance Sword of Mana is a full remake of Final Fantasy Adventure developed by Brownie Brown. Features of the original game were reworked to be brought more in line with the direction the Mana series had taken with the later games. Nintendo DS Children of Mana is an action-rpg with randomly generated dungeons which was developed by Next Entertainment. Creator Koichi Ishii was most interested in the further development of multiplayer gaming that was first attempted in a limited way in Secret of Mana. Mobile phone Friends of Mana is a multiplayer role-playing game set in a fictional world called Mi'Diel. Friends of Mana forms part of the "World of Mana" series and was the first original Mana title on mobile devices. The servers for the game were shut down on February 28, 2011. PlayStation 2 Dawn of Mana is the first fully 3D game in the Mana series, utilizing the Havok physics engine seen in Half-Life 2 that allows a large amount of player interaction with their 3D environment. In the series in-universe timeline, Dawn of Mana is set at the very beginning, while Children of Mana takes place ten years later. Nintendo DS Heroes of Mana is a tactical role-playing game and a prequel to Seiken Densetsu 3. It was born out of the desire to make a real-time strategy game similar to Age of Empires, StarCraft, and Warcraft: Orcs & Humans. iOS, Android Circle of Mana is a card battle game released on the GREE platform on March 5, 2013. Players fight to defend the Tree of Mana using cards featuring characters from Secret of Mana, Seiken Densetsu 3, and Dawn of Mana. All worlds are connected through the Tree of Mana, and players must recover the Sword of Mana to restore the balance. Cards can be combined to make them evolve and players decide what skills the characters become proficient in, like Seiken Densetsu 3. Players can also battle each other for points in coliseum mode. The service was ended on September 30, 2015.
iOS, Android, PlayStation Vita Rise of Mana returns the series to its Action-RPG roots, however this time as an 8-player co-op, free-to-play game with microtransactions. Set in the new land, Miste, the story revolves around the angelic Lasta and the demonic Darka engaged in an ages-long war for the mortal world. The soundtrack features contributions by composers from previous Mana games, (Tsuyoshi Sekito, Kenji Ito, Hiroki Kikuta, and Yoko Shimomura) and was released on April 23, 2014. The game service ended in March 2016 for financial reasons, though Square Enix is exploring other options to continue serving the game to players. iOS, Android, PlayStation Vita Adventures of Mana is a 3D remake of Final Fantasy Adventure released in 2016. The games original composer Kenji Ito returned to work on the remake, composing new music and making the score even more "dramatic". It also features updated graphics and controls. PlayStation 4, PlayStation Vita, Microsoft Windows A 3D remake of Secret of Mana, released in 2018. A common element of the series is its seamless, real-time battle system. The system was developed by Koichi Ishii and improved upon by Hiromichi Tanaka, out of a desire to create a system different from the one featured in the first few Final Fantasy titles. While action-based, the Mana battle system is intended to be playable even by newcomers as well as veterans. The system is coupled with the distinctive hierarchical "Ring Command" menu system, featured prominently in Secret of Mana and Seiken Densetsu 3, and to a lesser extent in later installments. Each ring is a set of icons with a textual infobox explanation which, upon selection, allow the player to use an item, cast a spell, look up in-game statistics, or change the game's settings. Navigation within a menu is achieved by rotating the ring through the cursor left or right, while switching to a different menu is achieved by pressing the up or down buttons. Although not part of the series, the spin-off Secret of Evermore, developed by the North American Square Soft, was also built upon the "Ring Command" system. The Mana series features several recurring characters and beings, including Final Fantasy creatures such as Chocobos in Final Fantasy Adventure and Legend of Mana, as well as Moogles in Secret of Mana and as a status ailment in Seiken Densetsu 3 and Sword of Mana. Watts is a dwarf blacksmith wearing a horned helmet who upgrades the player's weaponry. Usually, an anthropomorphic cat merchant is found outside of town areas and allows a player to save the game and buy supplies at high prices. This role is played by Neko in Secret of Mana, and Niccolo in Legend of Mana and Sword of Mana. In the Japanese games these merchants share the name Nikita. The Mana Tree and the Mana Sword, called Excalibur in Final Fantasy Adventure's English version, are recurring plot devices which have been featured in every game of the series. The mystical Mana Tree is a source of magic which sustains the balance and nature of the series' world. The Mana Sword is typically used to restore this balance when it becomes lost in the games. Final Fantasy Adventure explains that if the Mana Tree dies, a member of the Mana Family will become the "seed" of a new Tree. A sprout of the Mana Tree is called a Gemma, while protectors of the Tree, who wield the Mana Sword, are called Gemma Knights. In Seiken Densetsu 3, a Goddess is said to have turned into the Mana Tree after creating the world with the Mana Sword. The Mana Tree is destroyed near the game ending in Final Fantasy Adventure and Secret of Mana, but a character becomes the new Mana Tree in the former game. Elemental Spirits, also called Mana Spirits, are beings who govern the magic elements of the series' world, and are at the core of the games' magic system as they are used to cast magic spells. Eight types of spirits have appeared in the series since Secret of Mana, and each embodies a different element. Their names are homonyms of mythological beings or phenomena. In Secret of Mana and Seiken Densetsu 3, usage of their power is enabled upon the main characters' meeting with them. In Legend of Mana, the spirits serve as factors in the Land Creation System. In Legend of Mana and Sword of Mana, multiple spirits of the same elemental type appear. In terms of storyline, in Seiken Densetsu 3 and Heroes of Mana, the spirits are charged to protect the Mana Stones in which the Mana Goddess sealed eight elemental benevodons (God-Beasts in the fan-translation of SD3). In Dawn of Mana's North American version, each spirit speaks with a particular European accent, such as French or Scottish. Rabites, known as Rabi (ラビ) in the Japanese versions of the games, are cute, fictional, rabbit-like creatures appearing as a common enemy in the series since its beginning. 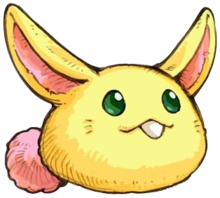 The Rabite has become a sort of mascot for the Mana series, much the same way as the Chocobo represents Final Fantasy, and is one of its most recognizable icons. The Rabite resembles a bodiless, one-toothed rabbit with large ears that curve upward and form a point at the tip, and a round, puffy pink tail that moves by hopping along the ground. It is most commonly yellow colored, but also pink, lilac, black, and white, and are variously minor enemies, "superboss" characters and even friendly units and pets. Rabites are also mentioned in Final Fantasy X-2 with an accessory comically named "Rabite's Foot", which increases a character's luck statistic; as well as Final Fantasy Tactics Advance, where they appear in the description of one of the game's optional missions as an endangered species due to being poached for good luck charms. Rabites have appeared prevalently in several pieces of Mana merchandise, including plush dolls, cushions, lighters, mousepads, straps, telephone cards, and T-shirts. Flammie, sometimes spelled Flammy, is the name of a fictional species of flying dragons, as well as the proper name of some its members, featured in several games of the series. A Flammie's appearance is a mixture of draconian, mammalian, and reptilian features, and its coloring has varied throughout the series. Flammies typically serve as a means of transportation in the game by allowing a player's characters to ride on a Flammie's back to different locations in the game's world. In Secret of Mana and Seiken Densetsu 3, the Super NES's Mode 7 graphic capabilities allows the player to control a Flammie from either a "behind the back" third-person or top-down perspective, and fly over the landscape as it scrolls beneath them. In terms of story, the Flammies were created by the Moon Gods, and are part of an endless cycle of destruction and rebirth as the stronger versions of Flammies—known as Mana Beasts, or God Beasts (神獣, Shinjū) in Japanese—destroy the world and the Mana Sword and Tree restore the world. The Mana series has had several different composers. Final Fantasy Adventure was composed by Kenji Ito; it was his second original score. Ito's music is mainly inspired by images from the game rather than outside influences. The scores for Secret of Mana and Seiken Densetsu 3 were both composed by Hiroki Kikuta. Despite difficulties in dealing with the hardware limitations, Kikuta tried to express, in the music of Secret of Mana, two "contrasting styles", namely himself and the game. This was to create an original score which would be neither pop music nor standard game music. Kikuta worked on the music for the two games mostly by himself, spending nearly 24 hours a day in his office, alternating between composing and editing to create an immersive three-dimensional sound. Kikuta considers the score for Secret of Mana his favorite creation. His compositions for Secret of Mana and Seiken Densetsu 3 were partly inspired by natural landscapes. In 1995, Kikuta released an experimental album of arranged music from the two installments, titled Secret of Mana +, which features one 50-minute-long track. Legend of Mana's score was composed by Yoko Shimomura, and of all her compositions, she considers it the one that best expresses herself. Kenji Ito returned to the series with Sword of Mana. He also composed roughly one third of the Children of Mana soundtrack, while the rest was composed by Masaharu Iwata and Takayuki Aihara. Ito was the main composer for Dawn of Mana, assisted by Tsuyoshi Sekito, Masayoshi Soken, and Junya Nakano, as well as main theme composer Ryuichi Sakamoto. In North America, purchasers of Dawn of Mana from participating retailers were offered a sampler disc, titled Breath of Mana, which features a selection of tracks from the game. Shimomura has returned to the series with Heroes of Mana, while also contributing one song to Rise of Mana. A five-volume manga based on Legend of Mana was drawn by Shiro Amano and published in Japan by Enterbrain between 2000 and 2002. It features a comedic story about the game's main character, here named Toto. A German version was published by Egmont Manga & Anime in 2003. A collection of four-panel comic strips, drawn by various authors and titled Sword of Mana Yonkoma Manga Theatre, was published in Japan by Square Enix on January 16, 2004. It included a questionnaire that, if sent back, allowed participants to win illustrations signed by Koichi Ishii and Shinichi Kameoka, as well as special T-shirts. Enterbrain also published a Sword of Mana manga adaptation in Japan on February 25, 2004, drawn by a collaboration of authors led by Shiro Amano. Two days later, Square Enix published a two-volume novelization of Sword of Mana in Japan written by Matsui Oohama. An original manga, named Seiken Densetsu: Princess of Mana, was drawn by Satsuki Yoshino and published in the Japanese magazine Gangan Powered on February 22, 2007. The Mana series has been mostly well received, though each title has seen varied levels of success. RPGFan called Final Fantasy Adventure one of the best things to happen to the Game Boy, while IGN considered it the best action RPG on the console after The Legend of Zelda: Link's Awakening. GameSpot referred to Secret of Mana as "one of Square's masterpieces on the SNES". The game has appeared on several list of top games, including ranked number 97 on Famitsu's top 100 games of all time. Seiken Densetsu 3 was called "easily one of the best RPGs to come out of the 16-bit era" by Nintendo Life. Famitsu rated Legend of Mana at 31/40 and Heroes of Mana at 32/40. The NPD Group ranked Legend of Mana as the top seller the week of its release, and in 2006 was re-released as part of the Ultimate Hits series. Many of the World of Mana titles have not been as critically successful as the original five games in the series, and though the franchise has been praised for their attempts at trying new ways of experiencing the games' fictional world, there have been various gameplay design flaws that have hindered the later games. 1UP.com commented that despite the game's excellent presentation and storytelling, Dawn of Mana did not match the level of gameplay of the early Mana games. Prior to the World of Mana games, RPGamer called the series a "treasured favorite". After the release of Heroes of Mana, they commented that the World of Mana series is "cursed", and the future of the series looked "bleak". The music of the Mana series, especially Secret of Mana, has received wide acclaim and fan enthusiasm. The Secret of Mana soundtrack was one of the first official soundtracks of video games music released in the United States and thus before fully mainstream interest in RPGs. The Secret of Mana's opening theme, "Angel's Fear", was rated at number 7 on IGN's Top Ten RPG Title tracks, calling it a "magical title song that captures our hearts". It was also featured in the third Orchestral Game Concert. Secret of Mana is also the number 6 most remixed soundtrack on the popular video game music site OverClocked ReMix, with Seiken Densetsu 3 tied at 18. The music of the other titles have also been well received. RPGFan called the music to Final Fantasy Adventure "addictive", despite its low, MIDI-like quality. GameSpy called Children of Mana's music some of the best Nintendo DS music yet and referred to it as "beautiful". Game Informer complimented Dawn of Mana's music, calling it good. IGN referred to Legend of Mana's music as "beautiful" and stated the background music brought "intensity", "suspense", and "subtle nuance" to the game. Other reviewers echoed similar praise with GameSpot calling it "excellently orchestrated" and RPGFan calling the music one of the game's good points. The Mana series has sold well overall, and as of March 2011, series titles have sold over 6 million units. The original Seiken Densetsu sold over 700,000 units, and its remake Sword of Mana sold over 277,000 copies in Japan. Secret of Mana has shipped over 1.83 million copies worldwide. Legend of Mana sold over 400,000 units in its first week alone as the highest-selling release that week in Japan, and over 700,000 copies in Japan by the end of the year. Children of Mana sold over 281,000 copies in Japan, and Dawn of Mana sold over 410,000 copies worldwide. Heroes of Mana sold over 178,000 copies worldwide. The PlayStation Vita version of Rise of Mana downloaded over 100,000 times. ^ "第２１３２８４４号". 商標出願・登録情報. Industrial Property Digital Library (via WebCite). April 28, 1989. Archived from the original on August 16, 2010. Retrieved August 16, 2010. ^ a b Collette, Chris (November 15, 2003). "Elusions: Final Fantasy IV / Seiken Densetsu". Lost Levels. Archived from the original on June 14, 2007. Retrieved June 9, 2007. ^ Basire, Casey (July 14, 2007). "The World of Mana series is returning, real-time strategy style". Nintendo World Report. Archived from the original on August 13, 2011. Retrieved February 15, 2008. ^ Parish, Jeremy; Cifaldi, Frank; Gifford, Kevin (December 2003). "Classics Column #1: Desperately Seeking Seiken". 1UP.com. Ziff Davis. Archived from the original on March 15, 2014. Retrieved January 21, 2014. ^ West, Neil (September 1994). "Interview with Ted Woolsey". Super Play. Future plc. ISSN 0966-6192. Archived from the original on September 14, 2014. ^ a b c d e f Day, Ashley (February 2011). "Featured: The Secrets of Mana". Retro Gamer. Imagine Publishing (85): 24–31. ISSN 1742-3155. ^ a b Gantayat, Anoop (October 6, 2006). "HAVOK For Mana". IGN. Ziff Davis. Archived from the original on July 20, 2015. Retrieved April 7, 2013. ^ Kohler, Chris (September 24, 2004). "More Compilation of Final Fantasy VII details". GameSpot. CBS Interactive. Archived from the original on December 16, 2014. Retrieved August 10, 2006. ^ Harris, Craig (August 10, 2004). "Nintendo DS Line-up, Part Two". IGN. Ziff Davis. Archived from the original on October 16, 2013. Retrieved December 15, 2014. ^ Gantayat, Anoop (September 28, 2005). "Mana At Last". IGN. Ziff Davis. Archived from the original on December 16, 2014. Retrieved December 15, 2014. ^ a b c d e RPGamer staff (October 6, 2006). "Children of Mana Interview". RPGamer. Archived from the original on December 8, 2014. Retrieved June 9, 2007. ^ Riley, Adam (January 15, 2009). "FF: Legend II Remade for Nintendo DS". Cubed³. Archived from the original on March 8, 2012. Retrieved May 10, 2009. A bit OT, but Koichi Ishii left Square Enix in 2007 to form Grezzo, a team that is working with Nintendo on a Wii game right now! ^ "Message from CEO" (in Japanese). Grezzo. January 15, 2009. Retrieved April 30, 2014. ^ a b c d Spencer (March 5, 2013). "Circle Of Mana Is Live, Has Lost Secret Of Mana Game's Class Change System". Siliconera. Archived from the original on July 21, 2013. Retrieved March 29, 2013. ^ a b NAKAMURA, TOSHI (March 3, 2014). "Here's What the New Mana Game is About". Kotaku. Archived from the original on October 17, 2015. Retrieved March 3, 2014. ^ a b Sato (February 1, 2016). "Adventures of Mana Is Now Available, Producer Shares A Message For Fans". Siliconera. Archived from the original on February 5, 2016. Retrieved February 4, 2016. ^ Frank, Allegra (August 25, 2017). "Secret of Mana remake hits PS4, Vita and PC next year". Polygon. Vox Media. Retrieved August 25, 2017. ^ a b Morcos, Antoine (December 15, 2006). "Interview Children of Mana" (in French). JeuxFrance.com. Archived from the original on October 4, 2011. Retrieved June 15, 2007. ^ a b Parish, Jeremy (April 5, 2007). "Heroes of Mana Preview". 1UP.com. Archived from the original on November 18, 2015. Retrieved June 15, 2007. ^ Bramwell, Tom (May 16, 2006). "Mana a Mana". Eurogamer. Gamer Network. Archived from the original on December 30, 2013. Retrieved December 15, 2014. ^ a b Sy, Dexter (June 9, 2000). "Final Fantasy Adventure Review". IGN. Archived from the original on October 18, 2012. Retrieved June 15, 2007. ^ Spencer (February 13, 2007). "Manavolution: the original Seiken Densetsu characters over time". Siliconera. Archived from the original on November 1, 2007. Retrieved June 15, 2007. ^ Adashek, Jeffrey (July 28, 2004). "Square Enix Polls Customers on Potential DS Ports". RPGamer. Archived from the original on November 6, 2006. Retrieved May 1, 2006. ^ a b Parish, Jeremy; Cifaldi, Frank; Gifford, Kevin (December 2003). "Classics Column #1: Desperately Seeking Seiken". 1UP.com. Archived from the original on March 15, 2014. Retrieved June 9, 2007. ^ a b "Ring Commands". Secret of Mana Instruction Booklet. Square Soft. October 3, 1993. pp. 13–14. SNS-K2-USA. ^ IGN Staff (April 30, 2003). "IGN's Top 100 Games of All Time". IGN. Archived from the original on September 10, 2009. Retrieved June 17, 2016. ^ "Reviews: Seiken Densetsu 3". 1UP.com. May 9, 2004. Archived from the original on November 18, 2015. Retrieved June 15, 2007. ^ Castro, Radford (2004). "The World of Emulation". Let Me Play: Stories of Gaming and Emulation. Hats Off Books. pp. 171–172. ISBN 1-58736-349-6. ^ a b "Monster Picture Book". Seiken Densetsu 3 Kisochishikihen 聖剣伝説3 基礎知識編 [Seiken Densetsu 3 Basic Knowledge Volume] (in Japanese). NTT Publishing. October 13, 1995. p. 131. ISBN 4-87188-805-3. ^ a b Riley, Adam (March 10, 2006). "Seiken Densetsu 3 / Secret of Mana 2 Review". Cubed³. Archived from the original on September 28, 2007. Retrieved June 13, 2007. ^ a b Vestal, Andrew (June 7, 2000). "Legend of Mana Full Review". GameSpot. Archived from the original on May 2, 2012. Retrieved June 15, 2007. ^ a b IGN Staff (June 6, 2000). "Legend of Mana Full Review". IGN. Archived from the original on October 17, 2015. Retrieved February 15, 2008. ^ Andrew P. Bilyk (June 1, 2000). "Different is Good". RPGamer. Archived from the original on October 17, 2015. Retrieved February 16, 2008. ^ Harris, Craig (December 2, 2003). "Sword of Mana Review". IGN. Archived from the original on February 19, 2014. Retrieved June 15, 2007. ^ Gantayat, Anoop (October 24, 2005). "Mana Developer Revealed". IGN. Archived from the original on October 19, 2012. Retrieved February 15, 2008. ^ "聖剣伝説 Friends of Mana" (in Japanese). Square Enix. Archived from the original on July 9, 2007. Retrieved June 15, 2007. ^ a b Pereira, Chris (September 20, 2012). "Japanese Cell Phone Treasures: 5 Mobile Games We Won't Be Seeing". 1UP.com. Archived from the original on February 7, 2016. Retrieved March 31, 2013. ^ スクウェア・エニックス石井浩一氏が『聖剣伝説』シリーズを語る!! (in Japanese). Famitsu. September 29, 2006. Archived from the original on July 2, 2015. Retrieved February 7, 2016. ^ Litowski, Theo (October 19, 2005). "Seiken Densetsu 4 Gets Physical". RPGamer. Archived from the original on September 30, 2007. Retrieved September 27, 2006. ^ a b Rubinshteyn, Dennis (May 18, 2007). "RPGFan Reviews — Dawn of Mana". RPGFan. Archived from the original on June 20, 2007. Retrieved June 16, 2007. ^ Bramwell, Tom (May 16, 2006). "Mana a Mana". Eurogamer. Archived from the original on December 30, 2013. Retrieved June 15, 2007. ^ a b Spencer (December 13, 2012). "Circle Of Mana Announced. Yeah, It's A Social Game". Siliconera. Archived from the original on March 20, 2013. Retrieved March 29, 2013. ^ Romano, Sal (February 1, 2016). "Rise of Mana to end service in March". Gematsu. Archived from the original on January 30, 2016. Retrieved January 29, 2016. ^ Romano, Sal (February 4, 2016). "Adventures of Mana now available for smartphones". Gematsu. Archived from the original on February 5, 2016. Retrieved February 4, 2016. ^ Riley, Adam; Smith, Lesley (February 8, 2007). "Square Enix on Nintendo DS, Wii, Online, Final Fantasy & More (Full Transcript)". Cubed³. Archived from the original on March 3, 2007. Retrieved June 15, 2007. ^ Nickel, Thomas (2006). "Hiromichi Tanaka — Final Fantasy III". G-Wie-Gorilla. Archived from the original on June 25, 2008. Retrieved June 15, 2007. ^ "Ring Command". Seiken Densetsu 3 Instruction Booklet (in Japanese). Square Co. September 30, 1995. pp. 16–17. SHVC-A3DJ-JPN. ^ "Ring Commands". Secret of Evermore Instruction Booklet. Square Soft. September 18, 1995. pp. 10–18. U/SNS-AEOE-USA. ^ Square Co. (June 7, 2000). Legend of Mana. PlayStation. Level/area: Monsters Encyclopedia. Chocobo — Nope, not the same Chocobo you know! ^ Square Co. (October 3, 1993). Secret of Mana. Super NES. Level/area: Great Forest. Moogle: ...Puu... / Princess: Listen! He's laughing! / Sprite: No, crying. Pebblers have taken over their village. ^ "Battle System". Seiken Densetsu 3 Instruction Booklet (in Japanese). Square Co. September 30, 1995. p. 22. SHVC-A3DJ-JPN. ^ "Battle". Sword of Mana Instruction Booklet. Nintendo. December 1, 2003. p. 30. AGB-AVSE-USA. ^ IGN Staff (June 6, 2000). "Legend of Mana Review". IGN. Archived from the original on October 17, 2015. Retrieved June 14, 2007. ^ Square Co. (October 3, 1993). Secret of Mana. Super NES. Level/area: Elinee's Castle. Neko: Meow, I got caught, purr... need anything now? Meow busy travelers! I'll even save the game! ^ "Party Member Characters". Legend of Mana Owner's Manual. Square Electronic Arts. December 1, 2003. p. 4. SLUS-01013. ^ Nintendo staff (March 18, 2004). "Sword of Mana". Nintendo. Retrieved February 14, 2008. ^ Fassino, Justin (November 25, 2006). "Review — Children of Mana (Nintendo DS)". GamesAreFun.com. Archived from the original on September 27, 2011. Retrieved April 30, 2014. ^ Square Co. (August 27, 2000). Seiken Densetsu 3 (Neill Corlett's fan translation). Super Famicom. Level/area: Temple of Light. Priest of Light: It is the implement which the goddess used to create the world. He who holds the sword of mana has the power to reshape the world, create and destroy life... it sleeps at the base of the mana tree under constant guard by the faerie. ^ Square Co. (October 3, 1993). Secret of Mana. Super NES. Level/area: Pure Land. Hero: Where are we? There's no Mana Tree... / Sprite: What the... After all we've been through! It's THANATOS'S doing! ^ Athab, Majed (April 15, 2007). "A New Era Dawns for Mana". RPGamer. Archived from the original on September 30, 2007. Retrieved June 14, 2007. ^ a b "Sprite Magic / The Girl's Magic". Secret of Mana Instruction Booklet. Square Soft. October 3, 1993. pp. 36–39. SNS-K2-USA. ^ "Growth System". Seiken Densetsu 3 Instruction Booklet (in Japanese). Square Co. September 30, 1995. p. 25. SHVC-A3DJ-JPN. ^ a b "Land Creation System". Legend of Mana Owner's Manual. Square Electronic Arts. December 1, 2003. p. 9. SLUS-01013. ^ "Battle". Sword of Mana Instruction Booklet. Nintendo. December 1, 2003. p. 26. AGB-AVSE-USA. ^ Square Co. (June 7, 2000). Legend of Mana. PlayStation. Level/area: World History Encyclopedia. The Creation — The Moon Gods created land and ocean, trees and flowers, and gave them light and the power to determine their fate. The light became the Elemental Spirits, riding in the sky. They released bountiful light, and were full of desire to serve the Moon Gods' will. The Moon Gods then finally returned to slumber. ^ Parish, Jeremy (September 22, 2006). "Preview: Dawn of Mana". 1UP.com. Retrieved June 12, 2007. ^ "La gallerie des monstres". Le Guide Officiel Nintendo "Secret of Mana" (in French). Nintendo. November 24, 1994. p. 64. SNSP-K2-FRA/SFRA. ^ Kepper, Sean (June 21, 2000). "Legend of Mana Strategy Guide". GameSpot. Archived from the original on June 12, 2007. Retrieved June 18, 2007. ^ "聖剣伝説 Friends of Mana" (in Japanese). Square Enix. Archived from the original on July 9, 2007. Retrieved June 13, 2007. ^ Leeper, Justin (April 10, 2007). "Heroes of Mana Preview". GameSpy. Archived from the original on March 4, 2014. Retrieved June 13, 2007. ^ Kolar, Damir (February 2, 2004). "Final Fantasy X-2 Game Guide". GameSpot. p. 94. Archived from the original on July 27, 2009. Retrieved June 13, 2007. ^ "Legend of Mana Products". RPGFan. Archived from the original on May 19, 2007. Retrieved June 13, 2007. ^ "Modes of Travel". Secret of Mana Instruction Booklet. Square Soft. October 3, 1993. pp. 30–31. SNS-K2-USA. ^ "Means of Local Transportation". Seiken Densetsu 3 Instruction Booklet (in Japanese). Square Co. September 30, 1995. p. 27. SHVC-A3DJ-JPN. ^ Square Co. (June 7, 2000). Legend of Mana. PlayStation. Level/area: World History Encyclopedia. Flammies — Then, a beautiful yet powerful beast appeared, awakening the Moon Gods. The Moon Gods named this beast of strength and beauty Flammy. Whenever one of the Moon Gods would fall asleep, another Flammy would appear. Eventually, Flammies of all six colors came to populate all the land. ^ a b CocoeBiz staff. "News". CocoeBiz. Archived from the original on May 16, 2007. Retrieved June 15, 2007. ^ Ezaki, Kahori; McCawley, James (December 2004). "Interview with CocoeBiz in December 2004". CocoeBiz. Archived from the original on July 18, 2007. Retrieved June 15, 2007. ^ Kikuta, Hiroki (August 25, 1995). Seiken Densetsu 2 Original Sound Version (liner notes) (in Japanese). NTT Publishing. PSCN-5030. ^ a b Jeriaska; Yamamoto, Taka (June 9, 2007). "Where Angels Fear to Tread: A Conversation with Hiroki Kikuta". Square Haven. Archived from the original on October 11, 2007. Retrieved April 30, 2014. ^ RocketBaby staff (2001). "Interview with Hiroki Kikuta". RocketBaby. Archived from the original on November 4, 2013. Retrieved June 15, 2007. ^ Kalabakov, Daniel (January 6, 2003). "Interview with Hiroki Kikuta". Spelmusik.net. Archived from the original on May 9, 2012. Retrieved April 30, 2014. ^ Kalabakov, Daniel (May 19, 2002). "RPGFan Soundtracks — Secret of Mana+". RPGFan. Archived from the original on June 11, 2007. Retrieved June 15, 2007. ^ RocketBaby staff (2002). "RocketBaby's Interview with Yoko Shimomura". RocketBaby. Archived from the original on December 5, 2002. Retrieved June 15, 2007. ^ Blair, Jody (March 26, 2007). "The Breath of Dawn on a New Hero of Mana". RPGamer. Archived from the original on September 30, 2007. Retrieved June 15, 2007. ^ Boulette, Bryan (September 13, 2006). "Square Enix Unveils Final Fantasy XII Sequel, Three More Games". RPGamer. Archived from the original on September 30, 2007. Retrieved June 15, 2007. ^ Shimomura, Yoko (February 26, 2014). "Yoko Shimomura tweet". Twitter.com (in Japanese). Archived from the original on March 17, 2014. Retrieved April 30, 2014. ^ Amano, Shiro (April 25, 2000). 聖剣伝説 レジェンド オブ マナ 1巻 (in Japanese). Enterbrain. ISBN 4-7577-0028-8. Archived from the original on May 2, 2014. ^ Amano, Shiro (August 25, 2000). 聖剣伝説レジェンドオブマナ第2巻 (in Japanese). Enterbrain. ISBN 4-7577-0208-6. Archived from the original on May 2, 2014. ^ Amano, Shiro (June 25, 2001). 聖剣伝説 レジェンド オブ マナ 3巻 (in Japanese). Enterbrain. ISBN 4-7577-0479-8. Archived from the original on May 2, 2014. ^ Amano, Shiro (December 25, 2001). 聖剣伝説 レジェンド オブ マナ 4巻 (in Japanese). Enterbrain. ISBN 4-7577-0706-1. Archived from the original on May 2, 2014. ^ Amano, Shiro (September 27, 2002). 聖剣伝説 レジェンド オブ マナ 5巻 (in Japanese). Enterbrain. ISBN 4-7577-1018-6. Archived from the original on May 2, 2014. ^ "Egmont Ehapa — Newsletter Nr. 22 vom 18.03.2003" (PDF) (in German). Egmont Ehapa. March 18, 2003. p. 3. Archived from the original (PDF) on February 12, 2012. Retrieved April 30, 2014. ^ a b 新約 聖剣伝説 (in Japanese). Square Enix. Archived from the original on January 9, 2007. Retrieved December 1, 2009. ^ 新約 聖剣伝説 アンソロジーコミック (in Japanese). Enterbrain. Archived from the original on March 7, 2012. Retrieved December 1, 2009. ^ ガンガンパワード新登場！！ (in Japanese). Square Enix. Archived from the original on July 3, 2006. Retrieved December 1, 2009. ^ "Square Enix – 製品ラインナップ" (in Japanese). Square Enix. Archived from the original on October 22, 2010. Retrieved June 10, 2007. ^ "Final Fantasy Adventure — GB". GameRankings. Archived from the original on March 14, 2009. Retrieved February 13, 2008. ^ "Secret of Mana Reviews". GameRankings. CBS Interactive. Archived from the original on February 2, 2014. Retrieved February 8, 2012. ^ "Seiken Densetsu 3". Archived from the original on September 24, 2015. ^ "Legend of Mana Reviews". GameRankings. Archived from the original on October 17, 2015. Retrieved June 11, 2008. ^ "Sword of Mana for Game Boy Advance Reviews". Metacritic. Archived from the original on October 15, 2013. Retrieved March 16, 2013. ^ "Sword of Mana for Game Boy Advance". GameRankings. Archived from the original on October 28, 2014. Retrieved October 27, 2014. ^ "Children of Mana". Metacritic. CBS Interactive. Archived from the original on May 1, 2014. Retrieved December 17, 2008. ^ "Children of Mana Reviews". GameRankings. CBS Interactive. Archived from the original on October 13, 2014. Retrieved December 15, 2014. ^ "Seiken Densetsu: Friends of Mana". Archived from the original on November 23, 2015. ^ "Dawn of Mana for PlayStation 2 Reviews". Metacritic. CBS Interactive. Archived from the original on December 1, 2014. Retrieved February 23, 2015. ^ "Dawn of Mana for PlayStation 2". GameRankings. CBS Interactive. Archived from the original on February 24, 2015. Retrieved February 23, 2015. ^ "Heroes of Mana for Nintendo DS Reviews". Metacritic. CBS Interactive. Archived from the original on February 3, 2015. Retrieved June 9, 2015. ^ "Heroes of Mana for Nintendo DS". GameRankings. CBS Interactive. Archived from the original on June 10, 2015. Retrieved June 9, 2015. ^ "Seiken Densetsu: Circle of Mana". Archived from the original on November 23, 2015. ^ "Seiken Densetsu: Rise of Mana". Archived from the original on November 23, 2015. ^ "Adventures of Mana for iOS iPhone/iPad". Metacritic. Archived from the original on February 8, 2016. Retrieved February 7, 2016. ^ "Adventures of Mana for iOS (iPhone/iPad)". GameRankings. Archived from the original on March 4, 2016. Retrieved February 7, 2016. ^ a b "RPGFan Review — Final Fantasy Adventure". RPGFan. Archived from the original on May 13, 2008. Retrieved February 14, 2008. ^ "History of Square". GameSpot. Archived from the original on October 12, 2007. Retrieved April 30, 2014. ^ "NP Top 200". Nintendo Power (200). February 2006. pp. 58–66. ^ IGN Staff (2005). "IGN's Top 100 Games". IGN. Archived from the original on June 16, 2016. Retrieved June 17, 2016. ^ IGN Staff (2006). "IGN's Top 100 Games". IGN. Archived from the original on July 9, 2016. Retrieved June 17, 2016. ^ Campbell, Colin (2006). "Japan Votes on All Time Top 100". Next Generation. Archived from the original on February 4, 2009. Retrieved August 8, 2007. ^ Dillard, Corbie (March 19, 2010). "Seiken Densetsu 3 (Super Nintendo) Review". NintendoLife. Archived from the original on March 11, 2014. Retrieved March 11, 2014. ^ 聖剣伝説 レジェンド オブ マナ. Famitsu.com (in Japanese). Archived from the original on October 17, 2015. Retrieved April 30, 2014. ^ 聖剣伝説 ヒーローズ オブ マナ. Famitsu.com (in Japanese). Archived from the original on May 2, 2014. Retrieved April 30, 2014. ^ "Legend of Mana Tops Sales Charts". IGN. June 16, 2000. Archived from the original on October 17, 2015. Retrieved February 12, 2008. ^ "Square Enix Adds 16 to Ultimate Hits Series". RPGFan. April 6, 2006. Archived from the original on October 17, 2015. Retrieved February 14, 2008. ^ Bozon, Mark (October 31, 2006). "Children of Mana". IGN. Archived from the original on December 14, 2014. Retrieved February 13, 2008. ^ Haynes, Jeff (May 22, 2007). "Dawn of Mana". IGN. Archived from the original on October 26, 2012. Retrieved February 13, 2008. ^ Fitch, Andrew (May 21, 2007). "Dawn of Mana Review". 1UP.com. Archived from the original on June 5, 2015. Retrieved May 14, 2009. ^ Bilyk, Andrew P. "Legend of Mana — Review". RPGamer. Archived from the original on October 17, 2015. Retrieved February 13, 2008. ^ Athab, Majed. "Heroes of Mana — Staff Review". RPGamer. Archived from the original on July 27, 2008. Retrieved February 13, 2008. ^ a b Sullivan, Meghan (August 8, 2006). "Top Ten RPG Title Tracks". IGN. Archived from the original on October 17, 2015. Retrieved February 13, 2008. ^ Thomas, Damian (January 1, 2007). "Secret of Mana OST". RPGFan. Archived from the original on April 10, 2008. Retrieved February 13, 2008. ^ Turner, Jon (September 2, 2000). "Game Music Concert 3 by Symphony Orchestra". SoundtrackCentral.com. Archived from the original on October 17, 2015. Retrieved September 3, 2006. ^ "Browsing: Games (530)". OverClocked ReMix. Archived from the original on March 4, 2008. Retrieved February 14, 2008. ^ Kemps, Heidi (November 2, 2006). "GameSpy: Children of Mana Review". Archived from the original on April 4, 2013. Retrieved February 21, 2008. ^ Juba, Joe. "Dawn of Mana Review". Game Informer. Archived from the original on June 21, 2008. Retrieved December 1, 2009. ^ "Review — Legend of Mana". RPGFan. Archived from the original on October 17, 2015. Retrieved February 21, 2008. ^ "Businesses – Square Enix Holdings". March 31, 2011. Archived from the original on March 25, 2012. Retrieved March 25, 2012. ^ "2003 Top 100 Best Selling Japanese Console Games". The Magic Box. Archived from the original on December 9, 2014. Retrieved February 4, 2015. ^ "February 2, 2004 - February 4, 2004" (PDF). Square Enix. February 9, 2004. p. 27. Archived (PDF) from the original on November 9, 2013. Retrieved April 7, 2008. ^ Carless, Simon (August 6, 1999). "MGT Report "Litigation Time"". Gamasutra. UBM. Archived from the original on May 29, 2008. Retrieved June 10, 2008. ^ "1999 Top 100 Best Selling Japanese Console Games". The Magic Box. Archived from the original on December 15, 2014. Retrieved February 4, 2015. ^ "PlayStation Awards 2000". IGN. Ziff Davis. June 29, 2000. Archived from the original on July 10, 2012. Retrieved July 19, 2008. ^ "Sony PS2 Japanese Ranking". Japan-GameCharts. Archived from the original on December 16, 2008. Retrieved December 14, 2008. ^ "FY2007 First-Half Period Results Briefing Session" (PDF). Square Enix. November 19, 2007. Archived (PDF) from the original on February 13, 2012. Retrieved January 13, 2009. ^ "2007年ゲームソフト年間売上TOP500" [2007 Game Software Annual Sales Top 500]. Famitsū Gēmu Hakusho 2008 ファミ通ゲーム白書2008 [Famitsu Game Whitebook 2008] (in Japanese). Tokyo: Enterbrain. 2008. Archived from the original on June 27, 2015. ^ "FY 2007 First-Half Period Results Briefing Session" (PDF). Square Enix. November 19, 2007. p. 6. Archived (PDF) from the original on February 13, 2012. Retrieved April 27, 2008. 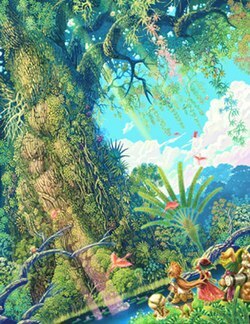 ^ "PS Vita版「聖剣伝説 RISE of MANA」が10万DL突破。記念キャンペーンを7月6日より開催". 4gamer.net (in Japanese). Archived from the original on October 17, 2015.